Greg Forster is a program director for the Kern Family Foundation; Gene Edward Veith is provost and professor of literature at Patrick Henry College; P. J. Hill is a cattle rancher and professor emeritus of economics at Wheaton College; Charlie Self is professor of church history at Assemblies of God Theological Seminary and has served as a local church pastor. CH: How would you define vocation? Greg Forster: I think of vocation as the imperative God places on us, and nurtures within us, to live all of life in ways that glorify him. We find this imperative operating in the deepest recesses of our own nature; in the world around us, in the structures of human civilization that we participate in every day; and in Scripture and in the life of Christian discipleship. Gene Edward Veith: When the Bible talks about God “calling” someone—to faith, to a particular task, to a way of life—it is teaching the doctrine of vocation. The defining Biblical passage on vocation is 1 Cor. 7:17: “Let each of you lead the life that the Lord has assigned, to which God called you.” God “assigns” to each of us “a life,” and then he “calls” us to that life. “Vocation” refers not just to the work we do to make our livings—that’s a secular appropriation of the theological term. Our vocations are multiple, found in the family, the society, the church, and the economic order. Charlie Self: Vocation is the broad sense of our purpose for being on earth, broader than simply the job that we do. It includes loving God with all our hearts and fulfilling his Great Commission, and it includes the specific way we do that with the gifts and resources and opportunities that we’ve been given. 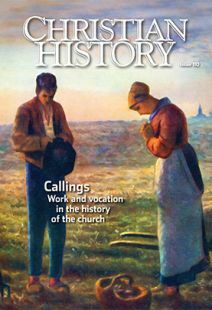 CH: How did you know God was calling you to your vocation? Did the Christian community help you discern that? Greg: I got the opportunity to do something that would have a big positive impact on a lot of people and that very few people are equipped to do. There wasn’t a lot of difficulty discerning that God would want me to take that job, so there wasn’t much for the Christian community to do in my case. Gene: I seem to have wandered into my various vocations with very little sense of choosing a particular path. Looking back, though, I see connections and design. Many Christians assume that God has one purpose for them and that they then need to find it on their own. I don’t think God works that way. We cannot evade or thwart God’s will. We find our vocations in ordinary ways—making a friend we end up marrying, getting turned down for jobs we want but settling for one that opens up at the last minute, growing up in a particular community, getting active in a particular church. My Christian community helped me understand my most important vocation, that I have been “called” by the Gospel. But we are also called to live out our faith in so-called secular arenas, and God is active there as well. It was in those realms that I found my vocations as an academic, a writer, a husband, a father, an American, and the like. Charlie: Four things helped me understand my sense of vocation. First of all, my own times of prayer and an inner sense of wanting to serve and be a light to the nations as I read the Scriptures. Second, the wonderful mentors God surrounded me with in my local church affirmed that I had gifts that could be put to use for the kingdom. Third, I was given an opportunity to serve on mission trips and in small groups, even as a teenager, and saw where my skills were best used. And finally, my vocation has been clarified through interaction with believers from around the world. God has given me a peaceful and powerful sense of mission, and I thank the Lord and the body of Christ, both locally and globally, for helping me fulfill my calling. CH: How has your calling changed over the years? Greg: God closed a lot of professional doors for me early in my career, and that was very painful. But the jobs and activities I undertook as a result equipped me with a very distinctive collection of skills and experiences. And then I got offered a job where I get to do amazing work which requires almost exactly that distinctive collection of skills and experiences. Sometimes God’s providence is mysterious, but not in my case. Gene: I pursued my love of literature by going to graduate school, never thinking of practical considerations. But then I was offered teaching jobs where I began to reflect and write about Christianity and culture. I left teaching to work as the cultural editor for World Magazine, but came to realize that my full vocation was in the academic world. At the moment, I am mainly an administrator. I value being able to help make our college the kind of institution I think it should be. And yet I would like to get back in the classroom more. In my family, my callings have changed: being a young husband, becoming a father, raising children, sending them off on their own, and now—one of the most fun vocations—being a grandfather. Vocation is in the here and now. At every stage, whatever our own preferences, we need to understand that this is where God has placed us and where he wants us to serve. In some sense he was correct; it just took me 40 years. I began as a full-time cattle rancher and gradually moved into teaching full time and still ranching. God has shown me that my life is to be out of doors, working with cattle, fixing the fence, rounding up, working with horses, but that I also have a place in the classroom. I’ve had a delightful life doing both of those. CH: What is one thing you have learned from the Christian tradition about vocation? Greg: Vocation is indispensable to combating sin and becoming people who combine grace and humility with a profound sense of responsibility and stewardship. The doctrine that all of life responds to a calling from God sets people free from paternalism and injustice, giving us dignity and meaning as human beings made in God’s image and made for a vocation. But at the same time, vocation is very strict with us about how we use our freedom, because the only freedom worth having is freedom for righteous living. Gene: From Luther, the great theologian of vocation, I learned that God himself providentially cares for his world by means of ordinary people doing ordinary things. He gives us daily bread by means of farmers, millers, bakers, and cooks. He creates new human beings by means of mothers and fathers. He protects us through public officials. He teaches his Word and gives spiritual care by means of pastors. He creates beauty by means of artists. He makes our lives easier by means of engineers and technology workers. And on and on. P. J.: The fundamental idea of the dignity of work is a very important aspect of our Christian faith. We may think of monks as just living in solitude and contemplating. Actually, monasteries were one place where work was dignified, and anybody could join as long as they met certain religious conditions. That changed the world because for a long time before, elites had regarded work as something beneath them. Charlie: That all of life is worship. Paul says to offer our bodies as a living sacrifice (Rom. 12:1–2), and all through church history, whether it’s the great work of Hildegard of Bingen, or Wycliffe’s Lollard preachers, or Pietists, or Methodists, whatever tradition, we understand that every single arena of service can bring glory to God. CH: Is there any Christian from the past whose life has been a particular model or inspiration to you? Greg: I feel a deep affinity with John Calvin. He repeatedly sacrificed his life plans when he saw that God was giving him greater opportunities to serve in other ways. He deeply desired a private life of scholarship, but he never got it. He stayed in Geneva when he wanted to leave, and then he left when he wanted to stay, and then he went back when he wanted to stay away—all because he felt responsible to serve God and not himself. Gene: As I’ve studied the Reformation, I thought that a fitting “patron saint” of vocation—if the Reformation had patron saints—would be Lucas Cranach, a close personal friend of Luther’s. Cranach, a major artist, popularized Reformation teachings by means of art. He set up a printing business that published Luther’s translation of the Bible. He mass-produced his woodcuts so that even peasants for the first time in their lives could own a Bible and put a work of art on their walls. As the mayor of Wittenberg, he lent important political help to Luther. He also essentially arranged Luther’s marriage. Charlie: Jonathan Edwards brought passion and intellect together. One of my great desires is to be a thoughtful, passionate Christian and I see in Edwards an example of that. Another would be the Wesleys, especially John. He combined practical realities of living the Christian life in community with an ecumenical spirit, embracing sisters and brothers from a variety of traditions. CH: What is the vocation of all Christians? Gene: The purpose of every vocation, said Luther, is to love and serve our neighbors. In the economic orders, these are customers and clients, colleagues and bosses. In the family, spouses love and serve each other; parents their children and children their parents. In our civic vocations, we love and serve our fellow citizens and pursue the common good. In the church we love and serve our fellow Christians. Charlie: We’re all called to live out the Great Commission, shaped by the Great Commandment of Jesus to love God and love our neighbors as ourselves. We’re all called in general to worship and to witness. We’re all called specifically to live out a particular calling in the context of our culture. CH: How does vocation apply to non-Christians? Gene: Was the farmer who grew the grain for my daily bread a Christian? I hope so. But in another sense, it doesn’t really matter; God used that farmer’s work to feed both the just and the unjust. But Christians can glimpse God’s presence in their ordinary lives, giving their work, family, and citizenship a transcendent dimension and meaning that nonbelievers miss.